Only and only Akshay Kumar can do this. Lovers out there, if you want lessons in how to make your Valentine's Day wishes unique, head to Akshay Kumar's social media feed right away. The 51-year-old actor tweeted a video of his wife Twinkle Khanna, in which she can be seen breaking into an impromptu gig, which appears to be her attempt at rapping. LOL. "Apna time aayega... apna time aayega...," she goes on singing to the tunes of the Gully Boy track as a half-embarrassed Akshay Kumar films the video. "When she's not educating me with new words to add to my vocabulary... my 24x7 entertainment. Happy Valentine's Day," he captioned the video and added two hashtags, which break down into "Pakaoing since 2001" and "Gully girl." Akshay's caption is a reference to Twinkle's hilarious tweet from Wednesday. Read on to know about that! While Akshay Kumar sort of gave a shout out to Ranveer Singh and Alia Bhatt's new release Gully Boy, we secretly know this is him taking badla for one of Twinkle's previous posts. 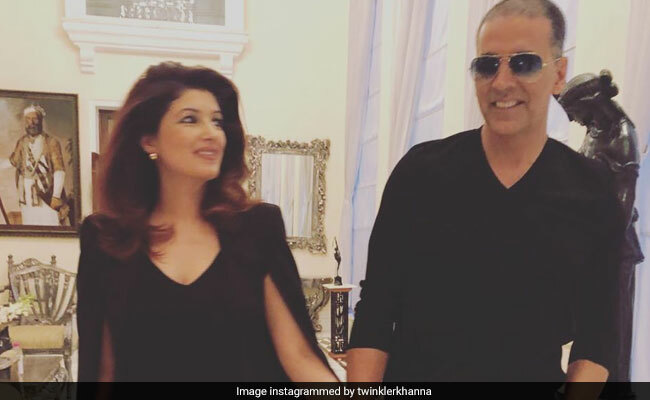 On Wednesday, Twinkle tweeted the details of a conversation between her and Akshay that ended with him branding her as "maha pakau": "A tip for Indian men: A black turtleneck can make most of you seem exponentially smarter-Just don't ask the woman sitting on the other side of your granola what 'exponentially' means. Also it doesn't help if you call the other person "maha pakau" when they give you the definition." We are rolling on the floor laughing right now. Akshay Kumar and Twinkle Khanna married in January 2001 and are parents to two children - daughter Nitara and son Aarav. Snippets from the couple's love story were shared on Koffee With Karan 6, with Twinkle describing Akshay as "six feet of chocolate ice cream" from when she first saw him. Twinkle had also confessed that she had told Akshay she would marry him if Mela flopped: "I called him on the Monday after the film's release and said 'I'll get married'." These guys are so darn cute. Happy Valentine's Day, folks!